In normal times, there are plenty of cultural events on each of the main Hawaiian awaiian Hawaiianislands. They are the life blood of the community. But Kauai was in a state of shock. Thus it was some time before the cultural calendar there started filling up again. We made it a priority to attend any cultural event that was held and, as the number of events began to increase, we found ourselves out more and more. The first Hawaiian concert we attended was in April of that year at Vidhina Stadium in Lihue. The community was still under enormous stress and, even seven months after the hurricane, destruction was evident everywhere. The concert offered welcome relief and a chance to have much needed fun. During one of the performances, it was announced that there would be a special guest dancer. A tall, slim figure came to center stage. Clean shaven with soft features that were refined, yet unmistakably Polynesian, his graying hair was pulled back into a pony tail. His clothes were unique. They looked more like something from India than Hawaii with a long kurta-like shirt and slightly baggy pants, also made from soft material, that were gathered at the ankles. His long sleeves were rolled up revealing tattooed rings in Polynesian designs down the length of each forearm. Even to my inexperienced eye, his style of dance seemed different and unique. His movements were graceful and deliberate yet sparing. His dance, telling the story of the beauty of the island of Kauai, was entrancing and easy to understand. He had a look of sheer ecstasy on his face. He was introduced as Frank Hewitt, although he now prefers to be known as Kawaikapu Hewitt. (His full Hawaiian name is Kawaikapuokalani � The Sacred Water of the Heavens). As soon as he began to dance, I noticed that Elandra rushed to sit in front of the stage. I was impressed, but did not fell the need to move from my seat. Once again, I was getting my first sight of another musical virtuoso who would have a profound influence on my life, although I had no idea at the time. In my hunger for Hawaiian music, I would try to listen to it on the radio as I drove to and from work (or anywhere else, for that matter). Incredibly, there was no regular Hawaiian music being programmed on Kauai. I was able to tune into a station from Honolulu but only on the parts of Kauai that were closest to O�ahu. Nevertheless, began to find out more about the music and the artists. I found out that most of the songs that I found the most moving and entrancing, were written by the same man. His name: Kawaikapu Hewitt. By 1996, things were close enough to normal that Elandra and I began to seriously consider finding ourselves a teacher. We had learned enough to know that everything cultural in Hawaii revolved around hula so the obvious thing to do would be to join a hula halau (dance troupe). Elandra wanted to be a dancer; I wanted to be a musician and chanter. Every major island has a number of hula halau. As we familiarized ourselves with the way things happen in Hawaii, we found out that you cannot just walk into any hula halau and expect to be accepted. Things have eased somewhat over the last fifteen years but, in 1993, there were plenty of halau that would not accept white people. Even if you were able to get into a halau, there was often racism and cliquism within the halau. I also found out that hula is very political. This kumu (hula teacher), for example, would not associate with that kumu, if you had been with this halau you could not associate with that halau. Though after twenty years of Sikh politics, it all seemed pretty tame to me. Still, we were invited to join a halau that accepted white people. After just a couple of weeks, I was castigated by one of the senior disciples (white) who accused me of flagrantly disregarding the traditions and protocol of the halau. I was deeply hurt since everything I had done had been under the direction of her husband who was also a senior member of the halau and Hawaiian to boot. I retired into myself and decided that I would just give up on the whole process. A few weeks later, Elandra said, �There�s a new kumu who�s coming over from O�ahu every week to teach. He says that anyone can join his halau�. �Well, I�m going even if you�re not�, she said. When Elandra returned from the class she said to me, �Look I talked to him. He says he�ll teach you to chant and how to accompany hula�. �Well, at least come by and meet him�. The next Thursday I showed up at the Outrigger Hotel at the end of class. The kumu�s name was Blaine Kia, a strikingly handsome Hawaiian with more than a touch of Chinese in his makeup. At the time, he was thirty one, exactly twenty years younger than me. �Oh, yes,� he said in what seemed to me to be rather too enthusiastic and jocular a tone, �I�ll teach you how to chant and how to play ipu heke�. I looked into his eyes and I could see what he was thinking. �This funny looking haole (white) guy won�t last more than two weeks�. I dutifully showed up for class the following Thursday. Blaine said �Hi� and went on to teach the class. I sat and watched. And observed. At the end of the class Blaine said �Goodnight�. This went on for six weeks. And the end of that time, I suppose I must have convinced him I was serious, because he started to teach me. Around that same time, he said to me �Bring your guitar next week, we�re going to do auwana (modern) hula�. �Kalihiwai, a song from my CD� he said. I went home, got hold of the CD and thoroughly learned the first two verses of the song, knowing that he would not teach the dancers more than that during class. I memorized the Hawaiian words and the harmonies. The next week at class, Blaine handed out the words to the song as he always did before teaching it. �Would you like a songsheet?� he asked me. �No thanks�, I replied. He gave me a funny look. In Hawaiian singing, the norm is for one person to sing a verse and then for everyone to join in for the second time through singing harmonies. That night, every time Blaine sang the verse for the second time, I joined in, word and harmony perfect. After that, he started treating me with much more respect. Blaine was young for a kumu hula. His hula lineage was from a legendary teacher named Darryl Lupenui, who brought about a revolution in men�s hula in the early eighties but then died young. Blaine had also learned from the late Uncle John Ka�imikaua, about whom, more later. His other kumu was Kawaikapu Hewitt. This was great for me. I felt like a circle was being closed, bringing me back in touch with a man who had been such an inspiration to me. Blaine had started teaching to propagate the lineage of 'Ihi'ihilauakea (Darryl Lupenui). Over time, he began to introduce more and more of Kawaikapu Hewitt�s material, both songs and choreography, into his repertoire. I received a very thorough education in song, chant, cultural tradition and, even though I never danced, in hula itself. Even though I was mostly learning in the tradition of Kawaikapu, I began to feel the huge presence of 'Ihi'ihilauakea. Which is why, even though I never met him, I always honor 'Ihi'ihilauakea �o Kapuwailani �o Noenoe�ula as one of my Hawaiian teachers. Blaine gave me the Hawaiian name of Pu�ukani o Ka Lani (the sweet voiced singer of the heavens). Blaine stuck his neck out for me in many areas. He never said anything to me but I think he copped a lot of flack for giving such an unusual looking haole guy a prominent role in his halau. He was a dedicated and devoted man and I felt privileged to learn from him. It wasn�t long before I was playing guitar and singing with him for rehearsals and public performances of the halau. My first public oli was at Ka Hula Piko on Molokai in 1998. Ka Hula Piko is an annual festival founded by the late Uncle John Ka�imikaua to celebrate the birthplace of hula according to Moloka�I legend. Uncle John was an extraordinary man. Discouraged from learning about his Hawaiian heritage when he showed an interest as a young boy by his parents, he began to learn from his grandmothers. He was then taught by a 92-year-old woman named Kawahinekapuheleikapokane (Sacred Woman Traveling on the Night of Kane), who began mentoring him at age 14. The Molokai kupuna (elder) taught him 156 Molokai chants, ranging in length up to 928 lines � 'an unbroken oral history of our people for 1,000 years,' he once explained." His teacher assured him that his generation would fulfill the prophecy of a Moloka�i chant from 1819, when Hawai�i�s royal leaders ordered the destruction of the temples of the ancient Hawaiian religion and overturned the kapu system of rules that controlled Hawaiian culture. The Hawaiian people would be brought low to the earth, the prophecy warned, losing everything. But in time, there would be a resurgence of the culture. Uncle John felt that now is that time.. And Kawahinekapuheleikapokane told him that he and those who came after him would not have to live the kapu. The event at the heart of the festival, takes place in the mountainous area known as Ka�ana, located on the heights of Mount Maunaloa, in the arid area of West Moloka�i. At around three am on Saturday morning, hula halau and committed spectators gather on the windy and often bitterly cold heights of Ka�ana. Sometimes there is a moon: sometimes not. Without a moon, there is no light to even see the dancers until the sky lightens in the East. That is not considered important. Each participant considers it an honor just to be there. The whole event is considered kapu (sacred). Each halau is allowed one oli and one hula; there is to be no talking. The discipline is strong and strict, the respect palpable. It was in this pressure cooker that I performed my first public oli and I was very nervous. As we sat back down on the dirt after our hula, I felt a huge whack on my back. I turned round and there was Blaine beaming at me. Later, at the day long ho�olaulea (festival) that follows, Uncle John was kind enough to congratulate me on my oli. That meant a lot to me. I continued to practice with the halau and appear with them in public performance. Once, after a show at Kukui Grove Shopping Center on Kauai, an old Hawaiian lady came up to me after we had finished. �I know who you are, I know who you are�, she called out to me. �Who am I auntie?� I replied. In 1999, I asked Blaine if I could compete in the Chant division of the King Kamehameha Hula Competition. This annual festival features the leading oli competition in Hawaii. If the Merry Monarch Festival is the Olympics for hula, this is the Olympics for chanters. �Yes�, he replied, �if you are prepared to work hard�. And so we began. Blaine is extremely talented in many areas. One in which he particularly excels is this: if any of his students enters a solo competition such as solo hula, he studies their character and writes a song and a hula that is a unique reflection of their personality. In my case, he wrote a chant for me in English that was translated into Hawaiian by his friend and fellow kumu, the very talented Michael Keala Ching. The resultant oli was about four minutes long, an eternity when you are out on the floor of a huge arena by yourself. It was called Ku Na Iwi. The oli told the story of someone (me) coming to Hawaii, of being entranced by the beauty, by the fragrances, by the traditions, but above all, seeking to know, to understand, to experience aloha. We trained together for about two and a half months. Blaine gave selflessly of his time but the whole process was intense. We had a couple of knock down drag out arguments and he yelled at me a lot, but we got it done. The night before I was due to perform, Elandra and I were in bed at my elder daughter�s house in the Tantalus district of Honolulu. I was so wired from nerves and excitement that I was half out of my body. I could feel the spirits moving in the jungle outside. All was silent in the house as my daughter was asleep. Suddenly, I heard a deep rasping breathing, like something from a monster movie. Elandra heard it too. Then I remembered. I had seen Uncle John Ka�imikaua�s halau perform a Mo�o dance and make this sound by moving their hands in front of their mouths while inhaling and exhaling loudly. Mo�o are the legendary giant lizards that populated ancient Hawaii and are said to still exist although rarely in their physical bodies. According to tradition, this was the sound they made. We felt a huge presence enter the room. It was neither good nor bad. It was simply curious. It wanted to know who or what was impinging on a space where it lived that was normally beyond the reach of humans. The presence examined us and then left. As it left we heard the breathing again. I was due to go on at around 4pm. I spent the whole day in the halau dressing room (they were competing in the hula competition) practicing. I was more nervous than I have ever been in my life. Finally, it was time for me to chant. At these competitions there is always a hubbub of conversation when one act finishes which only subsides when the next begins. My name was called and I strolled into the middle of the Blaisdell Arena, a huge basketball venue. By the time I reached my place on the floor, you could have heard a pin drop. The oli went well and the crowd cheered me as I left the floor. As I stood, dazed, out in back of the arena, a young Hawaiian woman rushed up to me and hugged me. �That was WONDERFUL!� she said breathlessly. When they announced the competition results, I recognized her as she accepted the prize for best chanter. After the competition ended, Blaine gathered all of the leis from all of us in the halau and took them to the grave of 'Ihi'ihilauakea, to lay them there in tribute. I didn�t win anything but I felt I achieved a great deal by even competing. 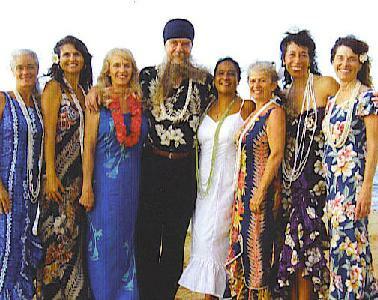 Around 2000, an informal group of ladies who wanted to practice hula formed on Kauai. Many of them were students of the well known writer Serge King and his organization, Aloha Internaitonal. Under the direction and inspiration of Kawaikapu Hewitt, they later were given the title of Halau Na Lei Kupua o Kauai and their director, Susan Pa�inui Floyd was given the title of Kumu Hula. It is very unusual and a great honor for a Caucasian to be so named. While I was never a formal member of this halau, I had the privilege to accompany them musically for many of their performances. 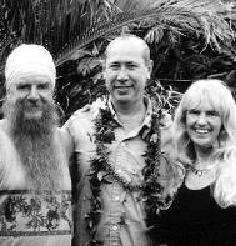 In return, they would often come to dance at my shows on Kauai and on O�ahu. I owe a great deal to them. In 2001, I began to record my first CD, One in the Goddess. In looking to forge a link between my Indian and Hawaiian cultural heritages, I found that they had a strong Goddess energy tradition in each culture. For the Hawaiian part, I drew heavily upon the compositions of Kawaikapu Hewitt, some of which had been co-written with Blaine. My second CD, Antion, Live on Kauai, could not have been made without the help and magnificent songs of Kawaikapu Hewitt. I fell compelled to honor both these men for the powerful traditions and teachings that they selflessly shared with me. I must also honor the late Uncle John Ka�imikaua for his constant inspiration and encouragement, as well as the late Darryl 'Ihi'ihilauakea Lupenui for inspiration from beyond.